The genus Equisetum (VG 1:6), with about 30 species, is the sole remaining representative of the once abundant and more diverse sphenopsids. It displays the stereotypical morphology that has been used to unite the sphenopsids into a clade. 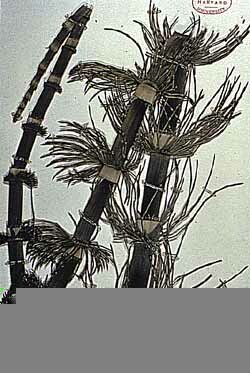 Specimens of the modern genus show the strong node/node morphology, whorled arrangement of parts, reduced leaves, ridged and grooved stems, "hollow" stems characterized by a large, empty pith cavity, terminal strobili, and clonal rhizomes. This latter feature is why it will do you no good to cut Equisetum if you want to get rid of it. Sporangia are born recurved on stalked sporangiophores. Many sporangiophores are clustered together to form strobili (VG 1:7)(VG1:8). 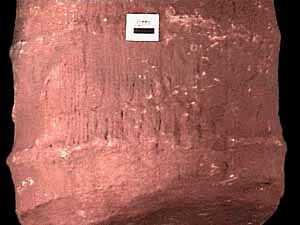 This recurved feature (Figure 6.3) has been key to the interpretation of many of the fossil plants we will discuss next. Now, think big! When you next visit the University's Botanical Garden, look for a shadow of former sphenopsid grandure in the tropical green house. Although large, none of these living plants produce secondary xylem. Figure 6.3: Evolution of the sporangiophore according to the telomist. (A) Putative ancestral state in sphenopsids, (B) Equisetum sporangiophore. 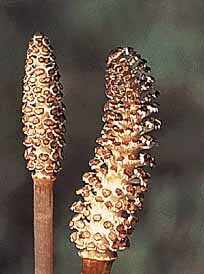 In internode cross section (VG 1:9), Equisetum is characterized by a large pithcavity. 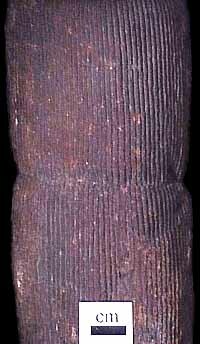 The vascular cylinder is divided into a series of discrete bundles, although this is not really a eustele. 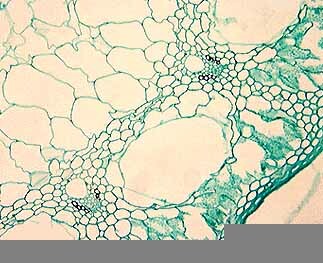 Empty spaces in each vascular bundle mark the former location of protoxylem. These early-differentiated tracheids were pulled apart and destroyed during internode elongation. Large openings in the cortex are called vallecular canals; these form as cortical tissue pulls apart during internode elongation (VG 1:10). 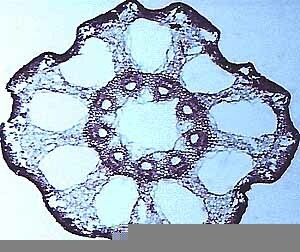 In microscope sections note that vascular bundles are reinforced by a bundle of cortical collenchyma that form the characteristic stem ridges in Equisetum. The node cross section of Equisetum looks quite different: the siphonostele is complete and leaf traces emerge from the solid vascular cylinder only at these locations (Figure 6.4). Above the node, the vascular cylinder divides again to form the discrete bundles you observed in the internode section. Look for these same features in the large, woody sphenopsids of the Paleozoic. Figure 6.4: Vascular system of Equisetum in longitudinal section. 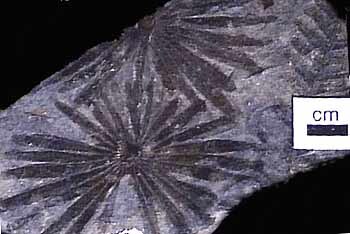 The evolutionary history of sphenopsids is similar to that of the lycopsids: They arose and began to diversify as herbaceous plants in the Late Devonian. The group reached a climax in abundance and diversity during the Pennsylvanian, where some representatives grew into stout trees that produced a small amount of secondary xylem. Sphenopsids waned in the Early Permian and many groups became extinct, although Neocalamites and Equisetites are recovered from Mesozoic strata. However, unlike lycopsids, Pennsylvanian sphenopsids were not coal-swamp specialists. Instead, they dominated lake margins and river banks, often colonizing sandy substrates where they were abundantly preserved as molds. Sphenopsids, including the arborescent forms, had extensive vegetative reproduction via sprouting from underground rhizomes (much like their living relatives), which made them well-suited for the shifting banks and bars of a meandering river. It is interesting to note that modern sphenopsids still prefer these habitats and 250 million years of evolution has not broadened their ecological range. Ibyka (Figure 6.5a) is an enigmatic genus known from the late Middle Devonian of Eastern U.S. (New York State). It has variously been described as a precursor to the Sphenopsids (see Stewart & Rothwell 1993) and to the ferns (see Taylor & Taylor 1993) due to its ambiguous set of characters. The axis of Ibyka branches pseudomonopodially in three dimensions; all branch orders are arranged more-or-less spirally along the axis. Dichotomously branching ultimate appendages have recurved tips or terminal fusiform sporangia. These dichotomously-branching appendages have been interpreted as precursors of leaves (megaphylls, Figure 6.5b and Figure 6.5c). The recurved nature of ultimate appendages has led some to link this plant with the sphenopsids. The phyllotaxy of the ultimate appendages has also led to confusion about evolutionary affinity of this plant. In some specimens, appendages are arrayed spirally (a fern link, but plesiomorphic), in others they appear almost whorled (synapomorphy of sphenopsids). This variation can sometimes be seen in individual specimens (note Figure 6.5a, a reconstruction). Stein and colleagues (1984) have proposed that this variation may be due to a lack of developmental canalization, which does emerge in the fern and sphenopsid lineages proper. This idea-that organisms ancestral to major lineages should show great variation in morphology, suggesting lack of developmental canalization-may hold true for many lineages. Be on the look out! Figure 6.5: Reconstruction of Ibyka. (A) Whole plant; note that the ultimate appendages show a highly variable phyllotaxy, from helical to pseudowhorled. (B) Vegetative appendage, (C) fertile appendage. The internal structure could tie Ibyka with either the ferns or sphenopsids. Its trilobed protostele is reminiscent of the fern stele, while lacunae at the tip of the lobes due to (mesarch) protoxylem disintegration has been interpreted as homologous with the carinal canals found in the axes of the sphenopsids. Based on the presence of lacunae, Ibyka comes out as a sister taxon of the sphenopsids in the cladistic analysis by Kenrick & Crane (1997; fig. 4.31). If this relationship is correct, Ibyka still lacks the strong node/internode morphology that is so characteristic of later sphenopsids. We therefore need to consider the developmental changes that would need to occur to produce the characteristic sphenopsid morphology from an Ibyka-like ancestral form. 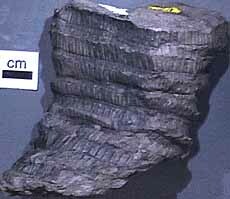 Calamites is the stem of the arborescent sphenopsids, preserved as both compressions and pith casts (VG 1:11). How were the pith casts formed and what do they represent in terms of morphology? (Hint: it's not called a "pith cast" for nothing!) Note the node/internode structure. Where would branches, foliage, or reproductive structures appear on this plant? Figure 6.6: Calamites reconstruction. (A) Whole plant; (B) transverse section through stem. Use your study of the internode cross section of Equisetum to guide your review of a cross section through a permineralized Calamites stem (VG1:12). Note the large pith, protoxylem, metaxylem, secondary xylem (VG1:13), and cortical development, including collenchyma reinforcement (Figure 6.6b). 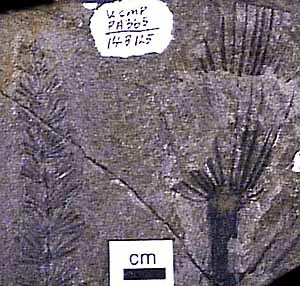 The leaf genera Annularia> (VG1:14) and Asterophyllites (VG1:15) are commonly preserved as compressions. What distinguishes these two forms from each other? 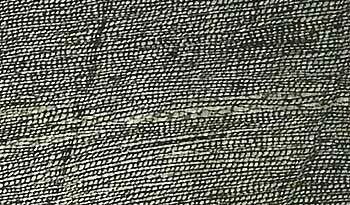 In sections of the root Astromyelon, note the relatively simple structure of the root, with large pith and well-developed secondary xylem. 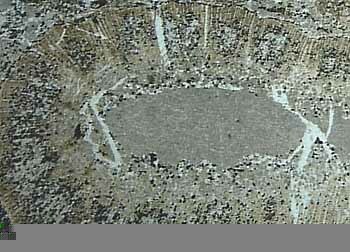 Calamites-like plants continue into the Triassic, where they are called Neocalamites ("new Calamites"). However, they are morphologically indistinct from their Paleozoic relatives. 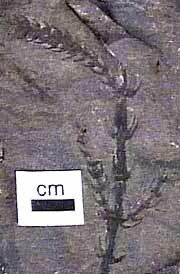 In sandstone casts of this plant (VG 1:16), take special note of the material in which the stems are cast. How does it differ from the Pennsylvanian-age casts you have studied? What does this tell you about the ecology of the plant and how that may have changed through time. Do you think it is valid in this case to give the Triassic form a new generic name? Explain. In the early Mesozoic, another form appears in the record: Equisetites (VG 1:17). This plant is morphologically indistinguishable from modern Equisetum. However, in this case, it may be somewhat more valid to give the fossil form a different name to distinguish it from the living form.